If you are planning to be in Yogyakarta between now and June 27 2016 for ArtJog 9: Universal Influence, be sure to pay a visit to Artemis Art’s debut exhibition in Indonesia. VICE VERSA features 20 artworks from thirteen Indonesian and Malaysian young artists. For some of the Malaysian artists, this will be the first time for them exhibiting in Indonesia as well. The exhibition begins on Monday, May 23 2016 at 7:30pm (Western Indonesia Time) with an opening reception, and continues until June 23 2016. Our opening coincides with Dedy Sufriadi’s 12th solo exhibition “Re-Texs Ture” held at Nalarroepa Art Space, just across the lane from where we will be exhibiting, some 25 m away. Details of the opening reception may be found at the Facebook event page created for this exhibition. 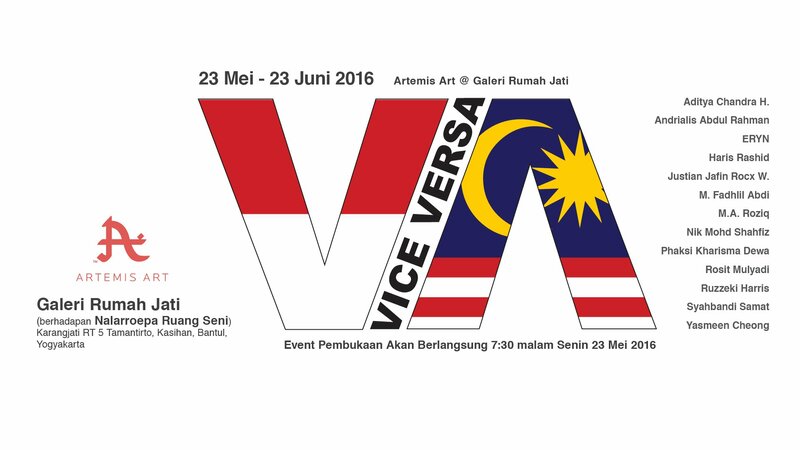 VICE VERSA is one of the events that has been listed as part of Jogja Art Weeks, a huge line up of art and cultural events taking place surrounding ArtJog this year. You can also download a PDF version of the guidebook that lists all the events in chronological order. Should you wish to visit the exhibition, kindly contact our gallery coordinator, Ms. Shinnera Ferara (or Rara for short) at +62 812-2651 5988. Click on this link to locate our ad hoc exhibition space, Galeri Rumah Jati, via Google Maps. For more information on VICE VERSA, check out the exhibition page, or contact us at [email protected].